If you ever feel like tasting luxury on your everyday camping adventure, turn to glamping. It is basically glamourous camping amidst nature. Yurts, eco-pods, tipis and gipsy caravans are some of the great ways to enjoy the outdoor surrounding without forgoing the luxurious life. You get the excitement of spending the night somewhere wild without worrying about the cold or feeling the rock under the sleeping bag. Even if you are not ready for camping, give glamping a try. They are irresistibly thrilling and you will always feel the desire to come back again and again. Here are 13 of the world’s most beautiful glamping destinations that you must visit to satiate your wanderlust spirit. White Desert’s Whichaway Camp in Antarctica is one of the most magnificent glamping destinations across the globe. The camp is open from November till January every year. They are a perfect retreat for travellers exploring Antarctica. Each of the cosy pods is heated with solar power and equipped with an en-suite shower. This is the place to relax and indulge in delicious food cooked by an award-winning chef. If you are travelling to Iceland to witness the Northern Lights, you would not want to waste even a second under the roof, isn't it? This is the when Buubble Lodge comes into play. This beautiful accommodation with transparent bubbles allows travellers to savour the view and at the same time protects them from the freezing cold outside. The exotic glamping destination is set up in a secret location in order to preserve the guest's privacy. A nearby service house has a shower, toilet and self-kitchen. Feel the adventure of a lifetime with your partner or best friend at the heart of Wadi Rum Desert in Jordan. This exquisite dome-shaped luxury camp is the perfect escape from the daily hustle of the city. No wonder, it is a glamper’s paradise where you can soak in the captivating tranquillity and connect with nature. Their prompt service and high-end amenities make this destination the ideal choice for a unique experience. Gaze at the stars and let the charm of this place seep into the soul. Take you glamping dreams to the next level amidst the rich flora and fauna in Sri-Lanka. Located in the lush green rainforest in Sigriya are the absolutely stunning tree houses that will delight every glamper. Fall head over heels in one of the tree houses and have the best time of your life. Soar above the trees and relish the authentic Sri-Lankan culture. It is one-of-a-kind of feeling that you cannot find anywhere else. Longitude 131 is popular for hosting eminent personalities like Prince William and Oprah. This is one of the most luxurious camps in Australia overlooking Uluru and offers unrivalled access to the red dunes of the desert. The lavish tents feature a climate control system, spectacular bathroom, wooden flooring and a king-sized bed. The tents also come with a specialized one-way glass that allows visitors to gaze out at the magical sight while protecting their privacy. Savour the heavenly surrounding of Torres del Paine from EcoCamp in Patagonia. This is one of its kinds that have a very low impact on the environment. The igloo-shaped domes feature some innovative concepts that support a sustainable way of living. The energy used on the site comes from all natural and renewable sources such as the sun, wind and water. The domes offer utmost comfort to the glampers and some of them are also equipped with private bathrooms and solar power. However, the scenic beauty around the glamping site is the real draw. In case you are looking for a Robinson Crusoe adventure, head to Lua Cheia Beach Camp in Mafia Island. There are three large eco-friendly tents that come with thatched verandahs that lead to the pristine beach. The tents come with solar powered lighting, solar heating and private bathroom. This is one of the best places to sink in jaw-dropping sunset views. Also, the private beach ensures serenity and tranquillity for those looking for some alone time. Located in the remote area of the Kaokoveld, Hoanib Skeleton Coast Camp is heaven in itself. The surrounding sand dunes, mountain backdrop, and vibrant wildlife make this place an adventure seeker’s paradise. It is hard to believe that such incredibly beautiful eco-villas can actually exist in this remote part of the world. There is a massive contemporary fireplace that adds warmth in the chilly desert evenings. The camp also features a swimming pool that offers a perfect contrast to the dry and arid starkness of the region. 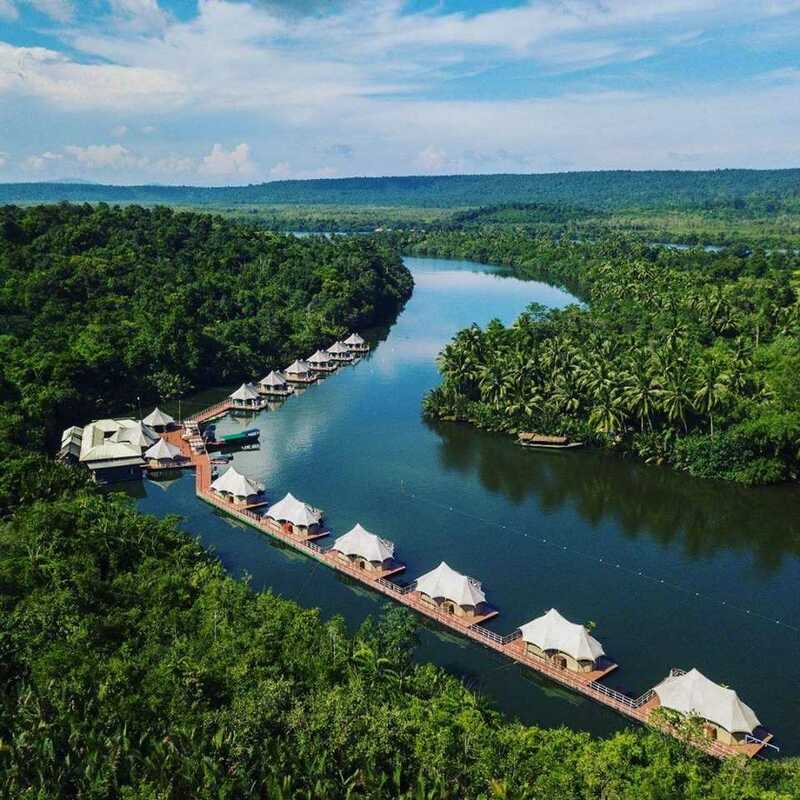 World’s first floating luxury tent resort, Rivers Floating Lodge is set up on the Cambodian Thai Border and enclosed by thick forests. They engage with the local community to spread environmental awareness. All the huts are eco-friendly and features luxury furnishing along with LCD televisions and internet access. They also offer a plethora of thrilling activities. Visitors can engage in kayaking as well as other strenuous activities like trekking and rafting. Get a taste of the Australian outback from Karjini Eco Retreat. This place offers a combination of traditional camping or luxury tents. They have a nice shared bathroom and barbecue equipment for electrifying bonfire nights. The tents sit on an elevated platform and use solar power. The alfresco restaurant will allow you to indulge in good food and relish the spectacular sight of the rugged scenery. The Halvorseth modern yurts are set up in the middle of an ancient forest. It is the first glamping destination in Norway, located at a distance of two hours from Oslo Airport. The grand huts let you get back to nature without compromising on luxury. The yurts are spacious and can accommodate up to four guests. They also have an inbuilt shower, toilet, television and a kitchen. There is also an on-site restaurant on the glamping site that serves freshly baked bread, pizza and more. Situated in the Alentejo region, the Nature Lodge features an exotic safari tent, one yurt and two tipis. Each of the accommodation comes with a spacious terrace and private bathroom. Relax in the swimming pool, soak up the splendid view overlooking the Alentejo hills or go for adrenaline pumping activities, this place has it all. If music is your forte, the nearby villages have their own fiesta during the summer months. Witness this special event and delight your soul. The Nature Lodge remains open from April to December. Aren’t you feeling the urge yet? Pin these glamping destinations on your travel board and starting planning for a wonderful vacation at the earliest. Water Parks in Jaipur You Must Visit This Summer!